Follow the recipe to get you started, then get creative in adding in special ingredients that your parrot loves. For this batch, I exchanged the dried fruit for fresh cranberries, pomegranate and coconut. I also added mung, adzuki and split peas to the garbanzo bean mix. I skipped the frozen veggies. Instead of the pasta, I added millet, buckwheat and wheat berries to the kamut and quinoa mix. Then topped it with a few walnut pieces, sesame and chia seed at serving time. I love the addition of the turmeric and cinnamon, it smell and tastes wonderful. (Yes, I tasted it, but I promise the rest is all for the parrots.) Oh and you can get a beautiful parrot calendar from their website too. Many kinds of birds come and go from The Landing, our adoption and education center in the Asheville, NC area. Therefore, we feed foods that can be enjoyed by a diverse group, but still ensures that each bird is eating a healthy variety of whole foods to complement their pellets, fresh fruits, pumpkin bread, nuts and treats. * You can hide things a bird might not eat otherwise by chopping it very small. * For convenience, you can make large batches, and freeze it in portions. * Mashes allow you to be creative, adding more or less of certain things to meet your bird’s needs. * Most importantly, you can cover all the important food groups in one recipe, knowing that your bird will probably be eating the variety needed for a complete meal. We have had huge success converting birds to better diets using a mash recipe, so we wanted to share it with you here. We complement this mash with an assortment of fresh fruits, pumpkin bread, and a small amount of egg cooked with palm oil (for vitamin A) and greens. The birds at the adoption center eagerly await their breakfast every morning, often shuffling back and forth on their perches in adorable anticipation. If you don’t have much freezer space, or a small number birds to feed, proportionally reduce these quantities. If you decide to make the recipe using these quantities, then you’ll want to start with a big soup pot. To start: bring the large pot of water to a boil. Add the Kamut, turmeric and cinnamon. Stir well. When the water starts to boil again, lower the heat to medium. Cook for 15 minutes. Add the quinoa and sweet potato. Stir well. Cook another 15 minutes. Turn off the heat. Drain or add some cold water. You don’t want the Kamut to cook much more, birds really enjoy it slightly crunchy. When the grains are drained and a bit cooled, put these in a super-sized mixing bowl, or divide into several if need be. Add the remaining ingredients (frozen vegetables, pepitas, garbanzo beans, pasta shells, dried fruit). Stir together. Divide into storage containers. Freeze in 2-3 day portion sizes. As you finish one container, take one out of the freezer to defrost. This recipe is versatile. Add and subtract other things that your bird may enjoy (e.g. 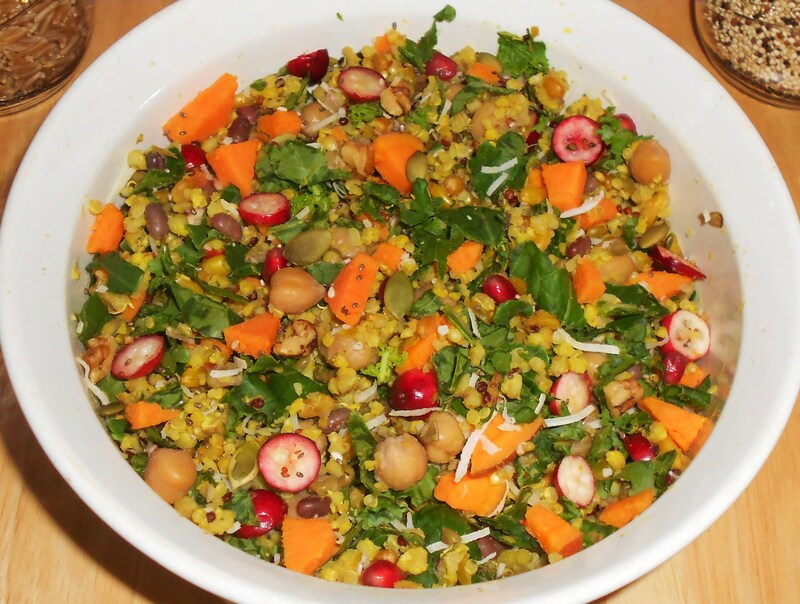 broccoli, coconut, fresh carrots, other grains, walnuts…). If your bird is reluctant to eat a mash, find the ingredient that is their favorite, and put extra amounts to pique their interest. After they are eating it regularly, you can change the proportions to insure that they are eating the variety intended. Thanks to Leigh Ann Hartsfield for her recipe “Franco’s Favorite Breakfast” in the Nourish to Flourish cookbook. 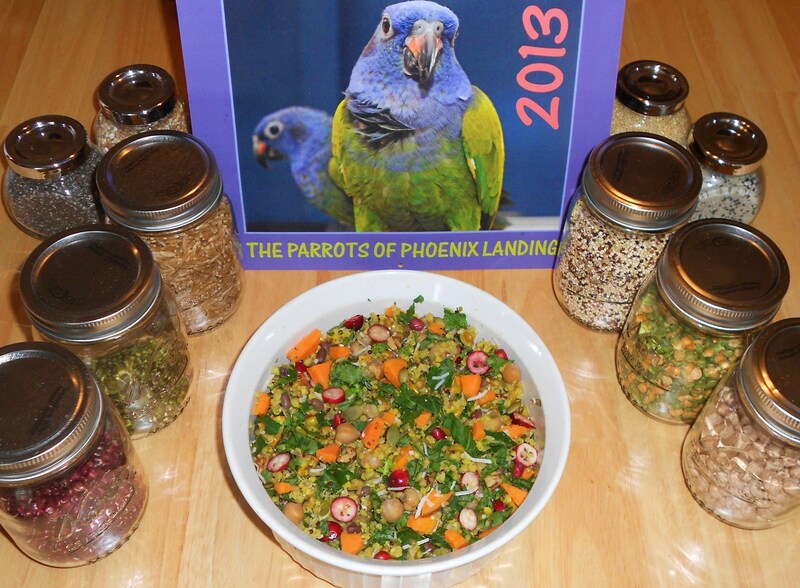 We started with this recipe, and the adoption center birds really enjoyed the addition to their breakfast meal. Then Mary Ault discovered that undercooked Kamut was very appealing to the birds, because they use their hookbills as nature intended, and crack open the grains. The Landing Mash continues to evolve as we add new things or change the proportions. And with spring on it’s way, we will take full advantage of the fruits and veggies of the seasons. If you try this recipe for your birds, let us know how it goes!